Heavy rains and flash floods caught drivers unaware and had a north side church bailing out. Water was still coming into All Saints Catholic Church Monday night, even after the rain stopped. "This is coming in from the outside from the street. I guess the ground is just saturated and came in under the ground," said facilities manager Marvin Worthington. That's one of two places water got into the church on Capitol Drive. It left their basement floor covered and shut down their hot meal program for the night. "Tomorrow there is suppose to be a food pantry," said Worthington. "We are going to have to shut that down too." 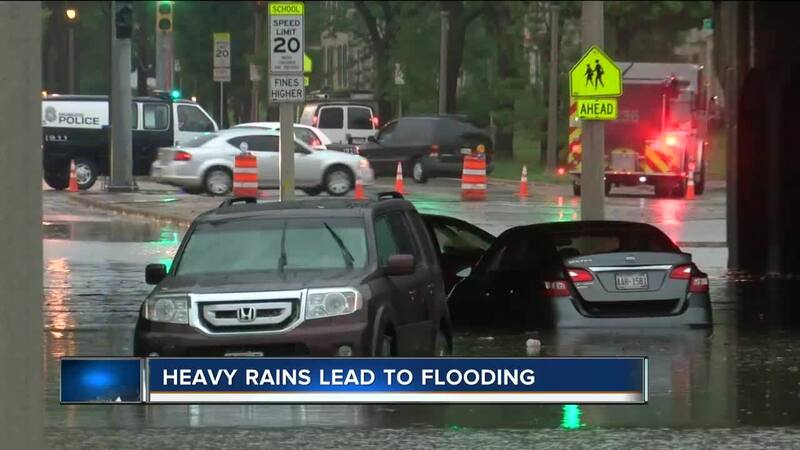 Just down the street, people on Capitol Drive near 35th Street faced dangerous flooding. Five cars were stuck under the bridge. Tracey Underwood says she watched other cars make it. She wasn't so lucky. She doesn't know how to swim. It was too deep for her to make. Underwood feared the worst when a Good Samaritan pulled her to safety. It was also Good Samaritans who freed a couple cars on Humboldt Blvd near Wright. The road flooded in a few spots leaving many people trying to drive over the grassy median. Finally, Constance Grassold got her rake out and cleaned the debris off the storm drains in the flooded roadway. "Best things to do is to unclog the drains," said Grassold. "I'm unclogging the drains." And the high water quickly went down.